Inside your body, hormones help your body change during puberty. 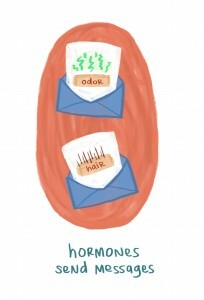 Hormones are tiny chemicals in our blood. They send messages inside the body through your blood, telling it how to change and grow. During puberty, there are many types of hormones found both in boys and girls. Two of those hormones are: Testosterone (T) and Estrogen (E).